Sorry about the late post today. It's been a busy morning and productive as well. I managed to get the house cleaning done as well as complete the Mojo Monday sketch for today. This was my first Mojo Monday since June and I have to admit the two back panels sorta threw me for a loop. It was a bit hard to get them situated just right and I'm not sure that I did in the end. I also chose a color combination from a SCS challenge that I had not seen before. I thought the combination of Not Quite Navy, Pretty in Pink and Rust was unique and I really liked the way they looked together. 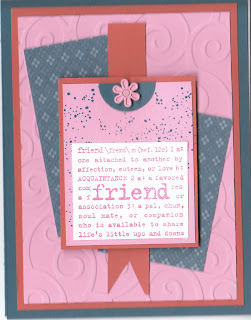 Since there wasn't really a lot of room for a sentiment I decided to just use a sentiment type stamp. This one is from the retired set Lexicon of Love. I know it's odd to use old stamps when new ones have just come out; but it worked, so why not, right? I also had time to do WSC challenge over the weekend as well. This card was designed largely around the buttons. This is a collection from Flora Doodles that I got from Archivers in Omaha. It's a whole bag of buttons that I think would make Kristina Werner giddy with delight! The dark button is actually a deep purple which goes well with the Razzleberry paper. I also got a chance to use my new Paper Pretties image from the Stamp of the Month Club. I still have one that I haven't used yet; but I will soon. The colors for this card are Soft Suede, Razzling Razzberry, Mellow Moss and Barely Banana. I colored the main image with copic markers. I don't have any curly label nesties or punches, so I decided to put it on a circle with a rounded square behind it. These are both just beautiful. I love the color combos, and the buttons on the second card are such a nice accent. What sweet cards! Beautiful layering with the Cuttlebugged backgrounds. Wonderful cards! You did an awesome job with the challenges! Blessings to you! Glad your back!! Pretty card..